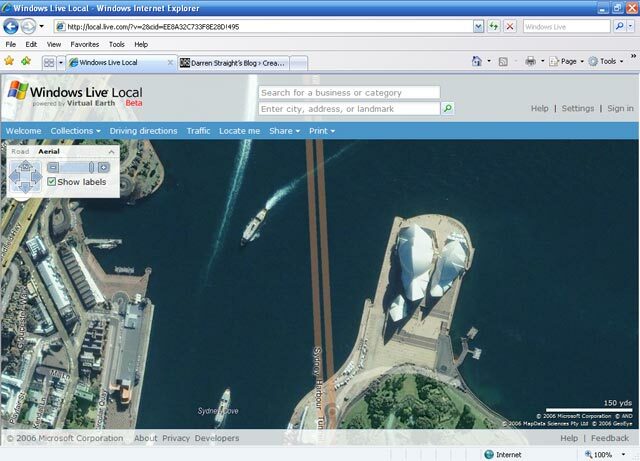 Not long ago I made a post on my own blog about Windows Live Local Coming to Australia after seeing this post on a Windows Live Local Australia Blog announcing it, unfortunately though Windows Live Local imagery support for Australia never happened! Driving Directions – Get directions between addresses, landmarks, or just right click on the map to set a waypoint. Here is a route from the Rocks to Perth – its a 48 hour drive. bring lots of water. Detailed street network and Aerial Imagery – Until now WLL has had major city coverage in AU, but with this release the Windows Live Local Team have rolled out a detailed national street network based on data from MapData Sciences. GeoEye is supplying lots of high res aerial imagery for major cities as well. Full API and Developer support – Get started with the Virtual Earth interactive SDK. Application developers have access to everything mentioned here making adding location services to your website a snap.